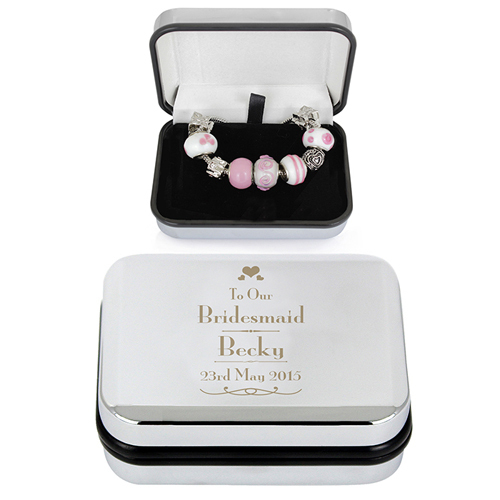 Personalise this Decorative Wedding Bridesmaid Silver Finish Presentation Box and Pink Charm Bracelet with a name up to 12 characters and a date up to 15 characters. 'To Our Bridesmaid' is fixed text. This "twist on" 21cm charm bracelet comes with pink charms that you simply twist on to the bracelet to make any design you like! This Bracelet comes with 9 charms, you can wear them all at once or pick and choose to your preference. Please note: We recommend measuring your wrist and adding 1 cm for tight fit and 2cm for loose fit to allow for the depth of the charms.